Every now and again we hear of some sort of unfortunate mishap at one of the many Chevrolet dealerships in the U.S., like this Corvette Stingray Premiere Edition that was crashed through a dealers window, or when a male deer decided to ram its way into a Chevy dealer Pennsylvania. But none have frustrated us to read as much as this story a user posted on the Camaro5 forums. The user in question traded his 1969 Camaro SS and 2011 Camaro SS in to buy a brand new, 580 horsepower Camaro ZL1. The car went in to the local Georgetown, DE dealer for a simple paint issue, which was covered by warranty. Back in December, an employee came in and decided to take the car for a little joyride, only to lose control of the car and slam it into a pole. Currently, the dealer and owners insurance companies are sorting this whole mess out. Seeing as the ZL1 was written off as a total loss, the owner wants the dealer to replace it, but the dealership has no interest in doing that. Typical. Police are currently investigating the incident. Criminal charges have not been laid against the employee, but as you can imagine, he no longer works at the dealership. We don’t know how this situation will pan out, but if you ask us, the dealer owes the owner a Camaro. Maybe gifting him a new Camaro Z/28 would be enough to restore the dealer’s now tarnished credibility. The dealer needs to own up to this. GM needs to put the pressure on the dealership to correct this. I find it somewhat Interesting that you added “Typical” to the end of sentence about the dealerships resistance. The fact that many like you consider it typical for a dealership to act in an underhanded manner underscores the need for change in how the dealerships do business. There needs to be a major revision to what incentivizes dealers in how they interact with customers. The former employee now drives a truck in Florida. But that’s another story. ^ LMAO at Main Wayne! Do away with dealers, full stop. They should be company owned stores with service bays and a parts counter. That, and as we continue to buy cars online, what point will there be for an on-the-floor sales rep? Joy Rides are not common at most dealers. My buddy lost a truck that has a AC unit dealer installed. They took it to the shop they out sourced it too for a repair and the guy shuttling it got t boned by another car. He ran a red light. The dealer at first said they could just buff it out but the truck was bent in the middle. A little talk with the owner and the threat of legal action got him a new truck with even a few options including factory air. I would say they are taking the path they are taking to work out an agreement. Odds are the guy will get a new car once it is said and done. If not they will be in court and the dealer will never let it get to that as it will cost them even more. Not the best way of doing business but that is the way most do it and not just GM dealers. I agree with ya, Sam. The dealer needs to man up and the guy should get a new car. I know I’d be mad as Hell about it. I hear they have five star crash ratings! While the car was in the “care, custody, and control” of the dealer, there was a potentially criminal act done by the now ex-employee. So while the insurance coverage is not cut and dried, the customer will be made whole, either by the dealerships insurance or the owners insurance. I would think that the dealership would replace the car if only to do damage control on the amount of PR that will result from this. I certainly wouldn’t shop at this dealership if this problem weren’t rectified in full for the owner, if only to strengthen this kind of boycotting power that is often consumers’ only resort. Well, that’s just it. 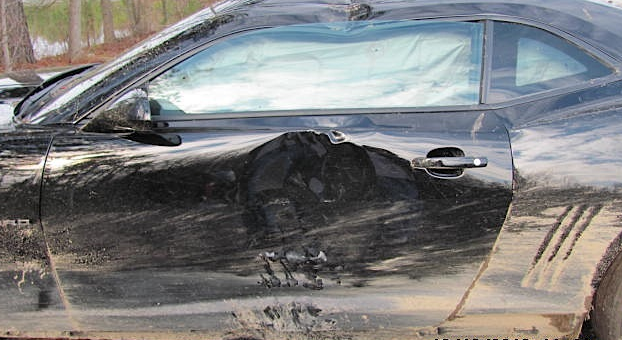 Aside from the fact that the perpetrator, a certain Eric Peterson, was an agent of the dealership–even if he wasn’t acting according to policies–the car was placed in the dealership’s care. According to an article I read, it’s suspected that Peterson told management he needed access to the building in order to grab a phone charger he’d left behind. If management let him in, they should have taken due diligence by supervising Peterson and not allowing him access to customers’ cars…especially if he was in sales or finance and therefore had no need to be anywhere near the ZL1 that was being worked on. Apparently, Peterson was also stopped by police for reckless driving, and was sent on his way with just a citation…even after he naturally wasn’t able to produce insurance, so some blame for the final outcome lies with law enforcement as well. But I believe that the dealership is overall at fault for the accident. It’s the same as if you have a bank vault, and the bank managers let some employee into a restricted area on good faith, who then turns around and breaks into your vault, robbing you of your valuables. The bank would have been charged with the safekeeping of your vaulted items and would have failed to meet that obligation. So too was the car dealership charged with the safekeeping of this couple’s car. They could have reasonably prevented it being stolen by not allowing an employee unauthorized access to it. Giving the couple a brand-new ZL1 would be the *honorable* thing to do; however I don’t necessarily think that it’s a legal obligation. The car would have depreciated since its purchase, and just as if someone had hit them on the street and totaled their car, they’re really only entitled to its value at the time of the accident. They wouldn’t automatically be entitled to the original purchase price of the car, or a brand-new replacement. So if they owed more than it was worth, hopefully they had GAP insurance. But again, the honorable (and probably long-term cheapest) thing for the dealership to do would be to just replace the car with a new one. I’m sure the owners (and other prospective customers) can understand that this employee’s actions aren’t representative of the entire dealership, but a replacement car would send that message of goodwill home. Thanks Bob for letting the facts get involves. The guy will be taken care of some how but it looks like it may be a deal were both insurance companies will help out once they negotiate a settlement. To be honest this was no different than if the car was stolen by a non employee. I expect the insurance companies are discussing if the car was in possession of the dealer so how much was on them or if this was on the owners insurance as it was plain theft as the guy who stole it may have worked at the dealer but he took it on his time for his own reasons with was committing a theft. In either case the owner will be covered and we can not just expect the dealer to just write a check our or hand over the keys to a $50K car when the insurance companies will cover it in the end. Believe it or not many dealers could not afford to just hand over this kind of money with out a major hurt on the dealers. Even if they could why do it when the insurance will cover it once they figure out who pays what and how to write this one up. You can call for honor and good will all you like but in the end it is a lot of money even to a car dealer and when it will be covered just let the insurance cover the car with the check they will send soon. In the mean time give the guy a SS to drive until this is worked out. Once the money arrives they can find and locate a car for him and sell it to him at dealer cost including all the roll back money to give him a deal he never got on the first car. But it is not a case here they will just hand him the keys and say sorry and let him keep the check. People have come wild expectations anymore as this was not just some $10-20 dollar deal. I would also find a way to charge this guy with theft. If someone who did not work there had taken a car they would have been charged too. Again thanks Bob for all the facts as it makes this a whole different story as it really was not just a joy riding employee. It was a car thief that just happen to work at the dealer who stole the car on his own accord on his own time. Time to let Flo and the Gecko work it out. Hmm All the fact that is why we should always have them and use them. The article said the car was a total loss so what is the problem. The insurance company will replace the car and life goes on. I worked at dealerships for thirty years and you can’t watch all of your employee;s all the time and believe me just like any other job there are bad eggs. The car needs to be replaced ASAP and the dealer needs to apologize and pay for the deductible. Whatever state this happened in… I wonder if they have an extradition agreement with Florida? The loser/perpetrator did one thing right… He fled to a warm state. Now that is a stupid statement. Have you ever worked at a dealership? Probably not. If you had you would not have made such a foolish statement. GM is out to make money, at the expense of employees, dealers and customers. Or to put it into street language they SCREW EVERYBODY! Customers would end up getting less items covered under warranty. THAT IS A FACT! I would believe the Dealership has insurance for all the vehicles in its possession, regardless of whether it was during business hours or when it is closed. The employee acted against policy, yet gained lawful access to the interior, by admittance, or keys, and the subsequent removal of the vehicle. He had to open the gates. Since he was in the company’s employ on company property, he is the responsibility of the company. I would bet medical insurance relates to the same conditions, whether on company property, or test driving vehicle for the company. Mr. Steve, is it quite adult like to call someone “stupid,” and better yet to hid behind an e-mail? I may not have worked at a dealership but I have been in management consulting for over 40 years teaching Fortune 50 companies how to manage their billion dollar businesses and portfolios, and yes GM is one of our recent clients. Unless your world in under a rock, money does rule. In addition, bad publicity can put a particular dealership out business; especially when there are other dealership that is willing to earn a customer’s business. You can only be screwed if you are the willing. You see Mr. Steve, it is people like you who think they have no power when it comes to big companies, and maybe that is why you get screwed because you happily bend over and spread, you just lie down to be the willing. I don’t subscribe that sort of conduct or thought of mind. I believe my money and business gives me enormous power. Unless posted, when a customer turns over the keys to the dealership employee; the dealer at that point accepts responsibility of safeguarding your vehicle minus personal property inside the vehicle. Simply put, if it wasn’t at the dealership the incident would not have happened, hence, the dealership is fully responsible.